“Hello everyone, and welcome to the first ever Grand Tour.” The unmistakable boom of Jeremy Clarkson, as he introduced the first episode of hotly anticipated new Amazon Prime show, The Grand Tour. If you haven’t seen it, beware, this article contains spoilers! The show opens cold, with a dejected looking Clarkson leaving a corporate building in the rain in England. He grabs a flight to LA, and picks up a Mustang hire car and heads out into the desert. In the background, two more Mustangs emerge from the wake of Jeremy’s car. No prizes for guessing the drivers – its old partners-in-crime, Richard Hammond and James May. As they race across the desert, supported by a massive fleet of eclectic cars, they converge on a festival, aptly named Burning Van. With the poignant melodies of “I can see clearly now” filling the air, they take centre stage in front of massive crowd. Three men who need no introduction introduce themselves, just to underline that this is an entirely new era. Welcome to the first of the 12 weekly episodes of The Grand Tour. 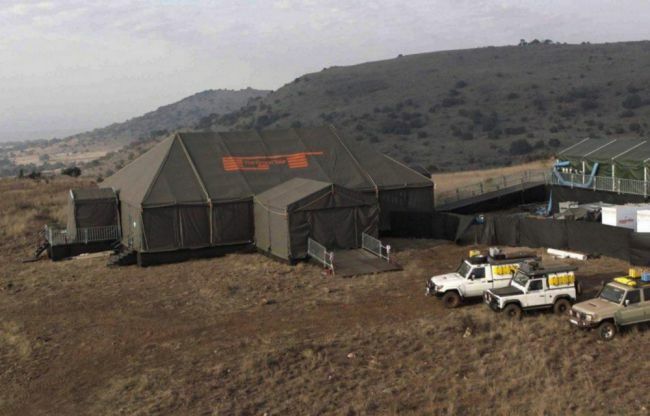 Rather than a fixed studio, as has been well covered in the media the show takes place in a tent. 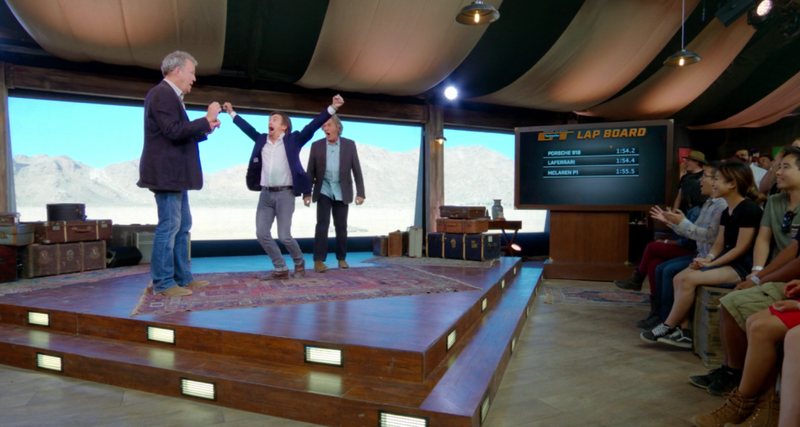 This first episode it is located in the Californa Desert, however the usual tropes of studio banter between Clarkson, Hammond and May and the audience bring a familiar atmosphere. A Prius appears on the screen, an electric car debate ensures and this cues a Porsche 918 vs McLaren P1 feature at Portugal’s Algarve Circuit. Whilst the McLaren and Porsche engineers setup the cars in the pits, witty banter straight from the days of Top Gear ensues, leaving us in no doubt that no chemistry is lost between these guys. 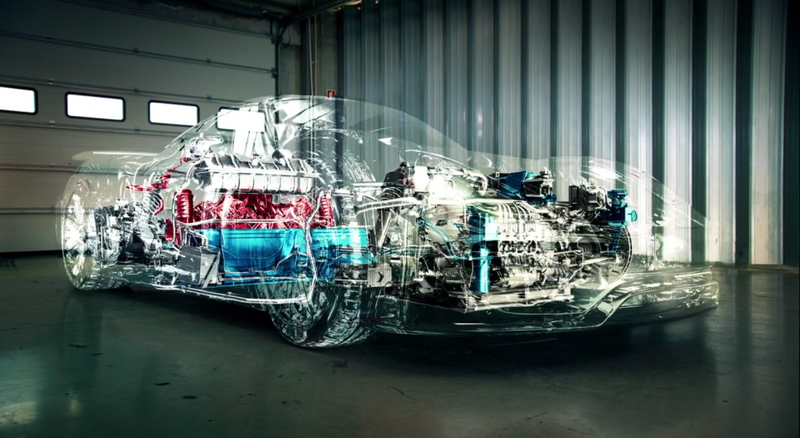 To illustrate the technology in these hypercars, some spectacular CG cutaways like the one of the 918 below reminds us of the wherewithal of Amazon and the enormous budget behind the show. It’s also immensely cool! James May then arrived in a La Ferrari, carrying on the The Ferrari, The Ferrari moniker again from the familiar Top Gear Days. All three cars hit the circuit against each other, Clarkson explaining these were the holy trinity of hypercars hence the show title. After a studio segment we were introduced to Eboladrome. 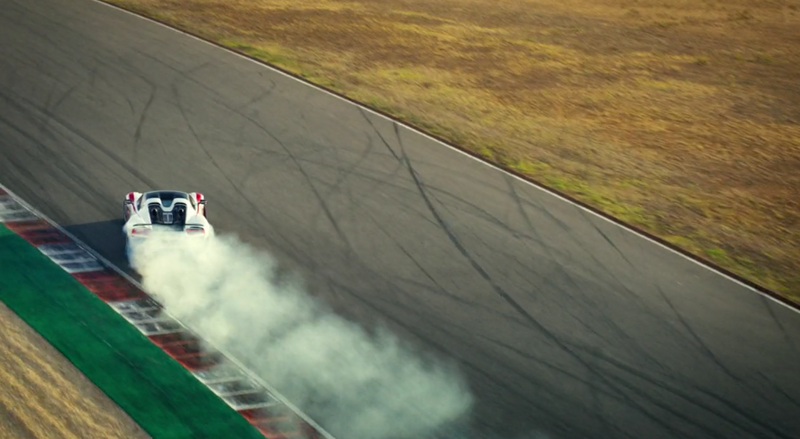 Basically the new version of Dunsfold test track seen in… Top Gear days. 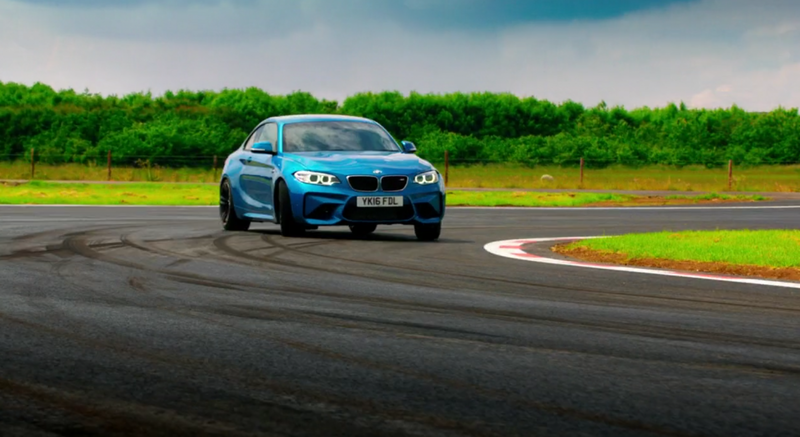 Clarkson introduces us to it’s many bends in a BMW M2, with corner names such as ‘Your Name Here.’ No Stig of course, but American Nascar driver Mike Skinner takes this role to run the BMW around the circuit. And go on a lap board. Sound familiar? A studio segment followed with what looked like a star interview. Bourne Legacy star Jeremy Renner jumped out of a plane and supposedly hit the dirt as his parachute didn’t deploy, and then other celebrities were overcome by death in similar ludicrous circumstances. Thankfully we were quickly back to the hypercar challenge, with the La Ferrari, Porsche 918 and McLaren P1 squaring up for some drag racing and lap times back in Portugal. Back to the studio tent and the lap times are teased out. The 918 trumps all, and self confessed Porsche fanatic Richard Hammond rubs it in. This was a return to form for the team we’ve really missed from our screens. Production standards were excellent, the filming and cars were breathtaking and despite some of the show being slightly contrived, guys the effort paid off. So what did you think? Post your thoughts below. We’ll be tuning in next week as the show moves to Johannesburg. ... quite the into! Also, The Hot House Flowers... Might go listen to a bit more of them! What a brilliant start to a show. Epic. Just watching mclaren vs porsche BBC would have never let them away with half of this! Pitching the mclaren vs Porsche engineers against each other! 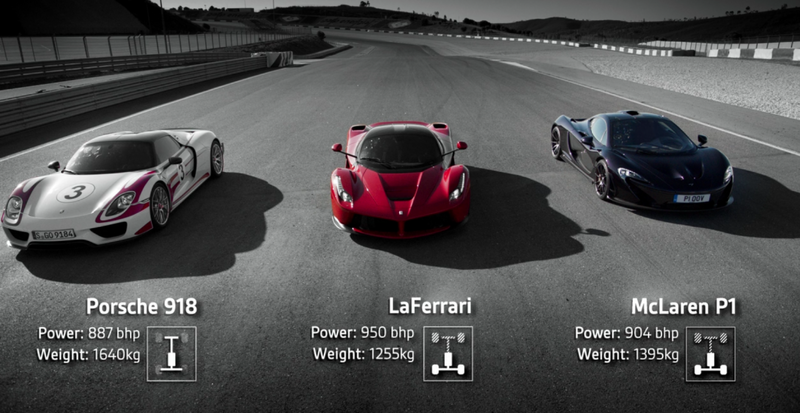 And the LaFerrari is now going to race the mclaren p1 and the Porsche 918 This is wonderful! The more I watch it, the more it's clear they have stuck fairly close to the old Top Gear format. Eboladrome isn't quite Dunsfold.